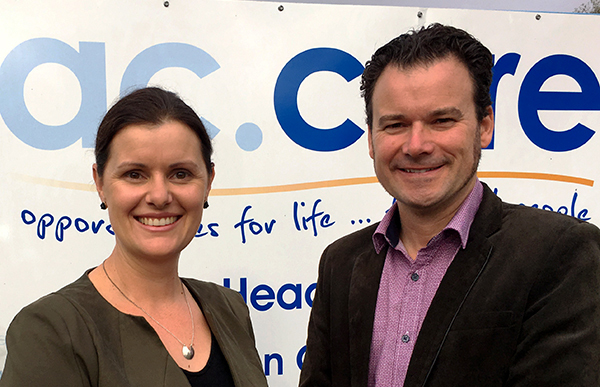 SHARING the message ac.care is a “country specialist” helping ensure people across eastern South Australia have a safe home, enough money to live on and strong, positive relationships is the focus of the organisation’s new communications department. FORMER editor of The Border Watch Newsgroup Jason Wallace has been appointed as our agency marketing and communications manager following the retirement last year of long-serving employee Anne Hinkly-Tyler. “Over 20 years in the newspaper sector, including the past eight as editor of The Border Watch in Mount Gambier, I became well aware of the valuable role of country-based agencies such as ac.care helping those who need a hand up in our community,” he said. He is joined in the role by marketing and development coordinator Leticia Gosse. Previously working with family agricultural supplies company LawrieCo for 15 years, she has experience in regionally focused marketing and business development projects. “I am fortunate to have grown up and lived in rural communities for many years,” she said. “Working with ac.care is a great way to be part of a social services organisation which has a focus on helping country people and continuing to create awareness of the need for specific social services in the regions. “In these early weeks it has been heartening to see the extensive support from local people, groups and businesses who can see a need in their home towns. The marketing team will have a focus on building community partnerships, highlighting the services and purpose of ac.care and supporting recruitment of foster carers and other supporters to build on the extensive work of the non-government organisation. “ac.care has a strong team of staff and supporters, but by developing and expanding our partnerships with the community further, we can work together to extend our impact, respond to needs and build resilience in communities in our service area,” Jason said.